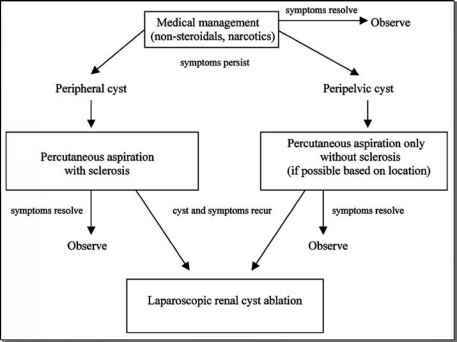 ■ Hemostatic adjuncts should always be readily available, because more substantive renal parenchymal excision may be required. Applying pressure with oxidized cellulose (Surgicel™a), or collagen-thrombin matrix products (FloSeal™b), provides excellent hemostasis for mild parenchymal bleeding. Argon beam coagulation may also be sufficient for mild oozing (the intra-abdominal argon gas rapidly generated when activating the argon beam has to be simultaneously released). For brisk bleeding, simple parenchymal figure-of-eight or horizontal mattress sutures of 2-0 or No.0 polyglactin on a computed tomography-2 or computed tomogra-phy-1 needle may be necessary. Lastly, if a wedge-type excision of the lesion is necessary, formal parenchymal sutures of No.0 polyglactin on a computed tomography-1 needle over Surgicel bolsters may be required for hemostasis. Hilar clamping may be required to control major bleeding, in preparation for formal laparoscopic partial nephrectomy.